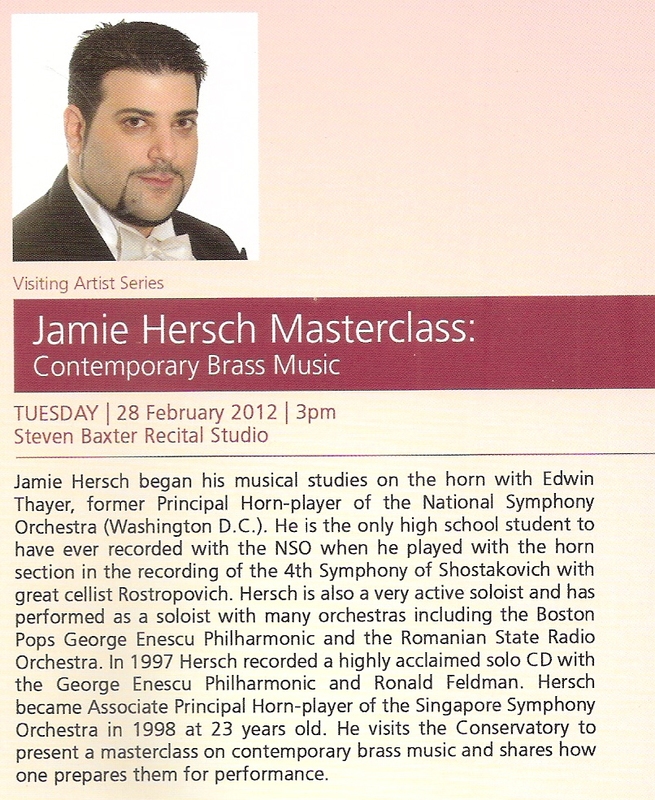 After several hours in front of the computer marking and assessing some of the student presentations for my History of Opera course, I felt a short break was necessary, so decided to sit in on the masterclass being given to horn students by Jamie Hersch, the not insubstantial horn player with the Singapore Symphony Orchestra. There were two specific reasons for my going, beyond the simple desire for a change of scenery. Firstly, I used to be a hornist myself and although the lip has long since collapsed, I still can feel the sensations of playing the horn even if I know attempting even a single note would finish me off for good; secondly the masterclass was billed as showing students how to prepare for playing contemporary music with all the rhythmic, technical and unconventional obstacles that involves, and that's a subject which deeply interests me. True, the two students brought up to play hardly selected ground-breaking contemporary pieces – at 84 Samuel Adler can still be counted a "contemporary" composer but Hindemith certainly can not, but we'll let that pass - but such was the deep fascination of Jamie's presentation that, instead of quietly slipping out after half an hour to get back to the assessments as I had planned, I found I sat through the entire two-hour session enthralled. How glad I was that I did. Jamie Hersch has a habit of finishing just one sentence in every dozen, and while this might normally be a major irritant, I found it strangely hypnotic. As he said acknowledging his inability to reach the requisite number of full stops, "I have so many ideas going round my head, but only one mouth". It was the strength of those ideas which made this all so compelling. The two students got barely 15 minutes each, so this was not a true masterclass. Instead it offered an intriguing glimpse into the lengths some musicians go to realise the creations of their peers. The main focus was not on the generalities of preparing a performance of a contemporary work, but specifically on Hersch's involvement in a performance of a work by his brother, composer Michael Hersch, which he had recently performed. Scored for horn and cello, lasting over two and a half hours and comprising somewhere in the region of 42 separate movements, this was not just another new piece to be learnt and played (and probably quickly forgotten), but obviously something much more heavyweight. To the extent that Jamie had designed and had built a new horn specifically to help cope with some of the music's more extreme challenges and that he had, by his own admission, spent two years learning the work, at one stage devoting 16 hours a day, every day of the week, just to perfect the obviously incredibly challenging horn part, this was obviously an exceptional level of commitment and not one, I suggest, he was recommending to the students in the audience. Such dedication towards a new work is not normally associated with orchestral horn players (or any other orchestral players, for that matter) but clearly this was not merely because the composer was the performer's brother (although Jamie did confess that "I love my brother to death"). From the extracts he played and from the score he passed around the room, it was clear that this is an exceptional piece of music. Whether Michael Hersch's Last Autumn needs to be so long or contain so many individual movements I cannot tell; I did feel that when we heard movements in isolation there was a sense of incompleteness, as if there was a very strong connecting thread running through the work. However, it is certainly full of great musical variety. A dauntingly challenging movement for solo horn formed the prelude to the masterclass, while we were also given a taste of a taut multi-voiced Fugue in which the cello acted out the four principal voices of the string section and the horn the four principal voices of the brass (Hersch described it as "an octet for two players" – a singularly apt description, it seemed), and a deeply lyrical "Lullaby" full of rich melody and firmly tonal harmony ("You'd never think this a contemporary piece", Hersch suggested). 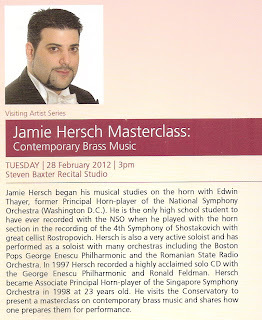 Had this been billed as a talk about one as yet unpublished and unrecorded work for horn and cello of gargantuan proportions, I don't suppose anyone would have turned up, so it was wise that it went under the title of Masterclass. But I am eagerly awaiting the promised recording of the work in the near future. It will never be one of the classics of our time, simply because concentration spans amongst audiences prevent works of such dimensions attaining anything more than minority cult status (look at Havergal Brian's "Gothic" Symphony) and, in any case, 155 minutes of horn and cello create a perceived barrier which keeps the public away even before they have heard a note, but I have a very strong suspicion that this is an unusually worthwhile new work.